Something must be done. Naomi needs to sell her land and by custom, it must stay in the same family. So, Boaz presents his case. 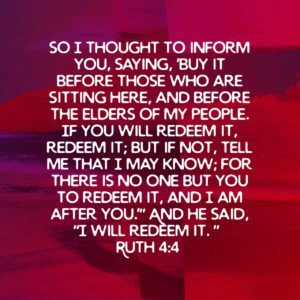 Read Ruth 4:3-4. Boaz found the man that he needed to have a discussion with. Boaz then got a group of men together to make the discussion legal. Now, he is presenting the facts of the situation. Naomi needs to sell the land, but it should stay within the family. That is why these two men who are relatives need to make a decision about whether they can buy that land. When we are faced with decisions to make, do we review all the information? Do we gather all the relevant people? Or do we just make a decision and hope it was the right one? Boaz knew what he wanted to have happen, which was for him to purchase the land and be able to marry Ruth. However, he also recognized that there was a process involved with this and he needed to ensure that since there was another who was eligible as well, that person had the opportunity to review all the information. When we have a decision, do we get the appropriate people involved? Or do we try to go it alone? God knows that we need each other and as we are working together we will be able to follow his plan.